Murders, suicides, electrocuted persons, train, car and plane crashes, catastrophes and disasters are the tragic events constituting the obscure universe of this Mexican photographer. His aesthetics is drawn from his taste for ciné noir and his passion for police investigation. 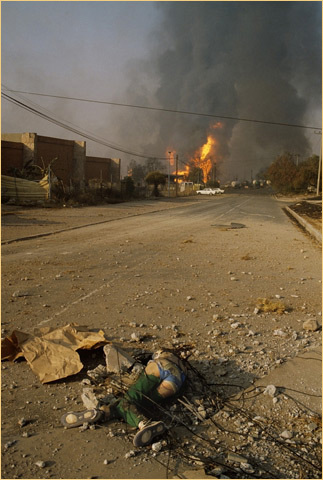 His composition is moderate and does not make excessive use of pictures of victims in the foreground. It avoids sensationalism and as Carlos Monsivais used to say, "There is nothing morbid about Metinides' work." His position as an impartial observer contrasts with that of those who gaze at his photographs, with their many perspectives that question the spectator. Deafening silence is another great element with which Enrique Metinides composes his images. The work of Enrique Metinides is of incalculable value, both because of its record of Mexico City with all its contradictions, making him the photographer of Post-Modernism and because of the aesthetic value of his colossal oeuvre. For the past 10 years, his works have been displayed in contemporary art galleries and MOMA acquired several pieces for its permanent collection. The market's interest underscores the questioning of the way we regard death and its evolution over time. The selection of 17 color photographs and the previously unreleased video displayed in the Garash gallery reflect the desire of curators Véronique Ricardoni and Rodrigo Espinosa to provide a representative sample of the artist's most recent work, including photomontages created from his photographs and collection of toys. 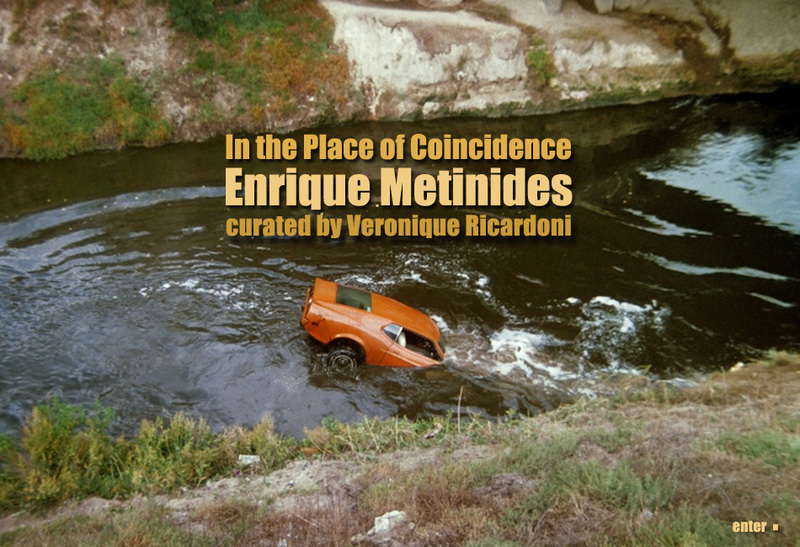 The exhibition's curatorship attempted to use a few, iconic images to reflect the violent flow of production and the record of the moments when life takes its leave as well as the violent flow of creation and artistic recreation as the eternal staging of the possible purpose of anonymous existences in which Enrique Metinides’ work restores both light and memory. 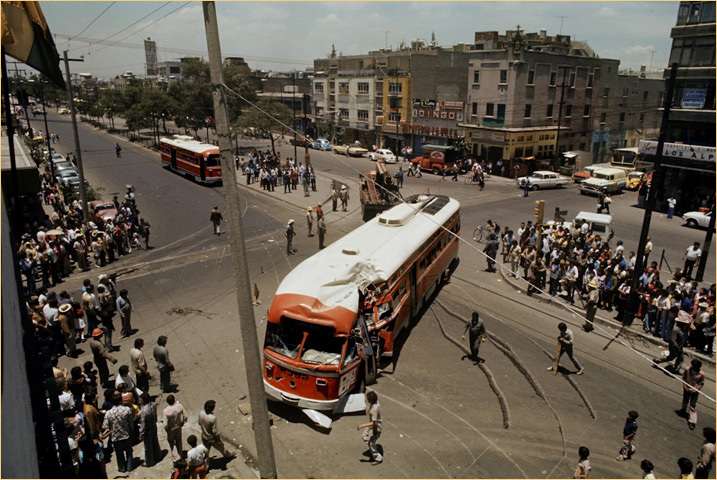 A streetcar was derailed in Calzada de Guadalupe, three blocks from the Basilica. The streetcar crashed into a lamp-post, injuring 15. The 1980s. Attack on security vehicle by armed commando in Av. Universidad. The attackers shot three policemen. 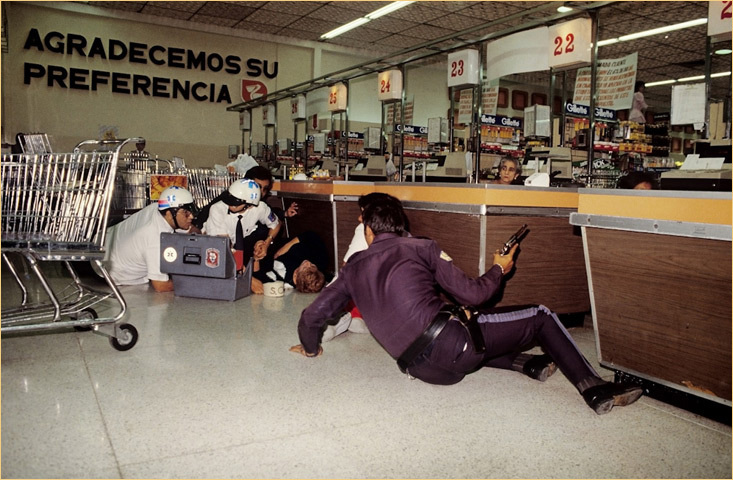 While they were escaping with the money, several police cars turned up, forcing them to take refuge in Comercial Mexicana, where another violent shoot-out ensued. The assailants eventually got away with the money. September 1988. 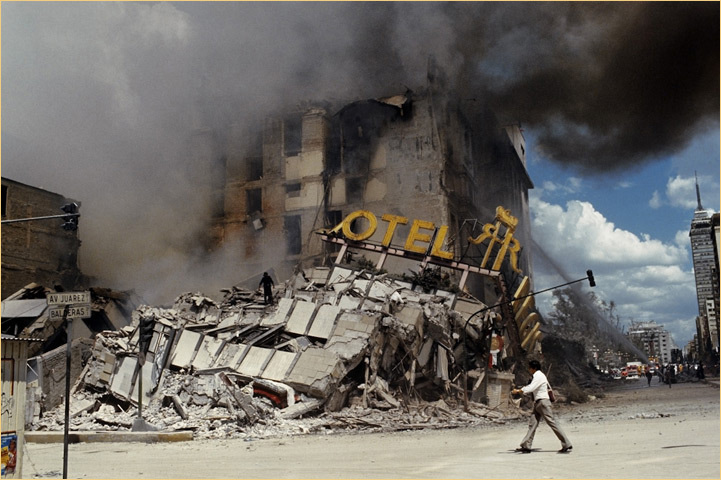 The Regis Hotel, with its three cabarets, a pharmacy and a café were destroyed by the 19 September 1985 earthquake. 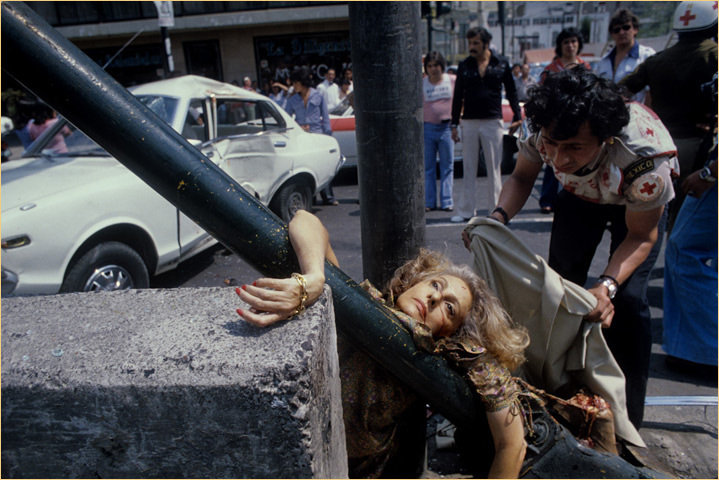 Hundreds of dead and wounded, 20 September 1985. 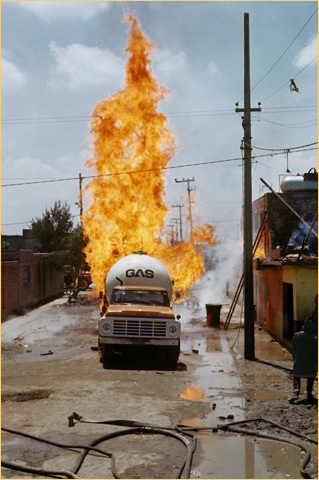 Explosion of propane and butane LPG (Liquid Petroleum Gas) Storage and Distribution Plants, owned by Petróleos Mexicanos Pemex, in Colonia San Juan Ixhuatepec in San Juanico, Mexico State. Over 1,000 persons were injured by the blast. 19 November, 1984. EExplosion of LP gas truck in Colonia Federal in Mexico City, while it was delivering gas to a tortilla store, injuring 7 persons who were subsequently treated at the Red Cross. 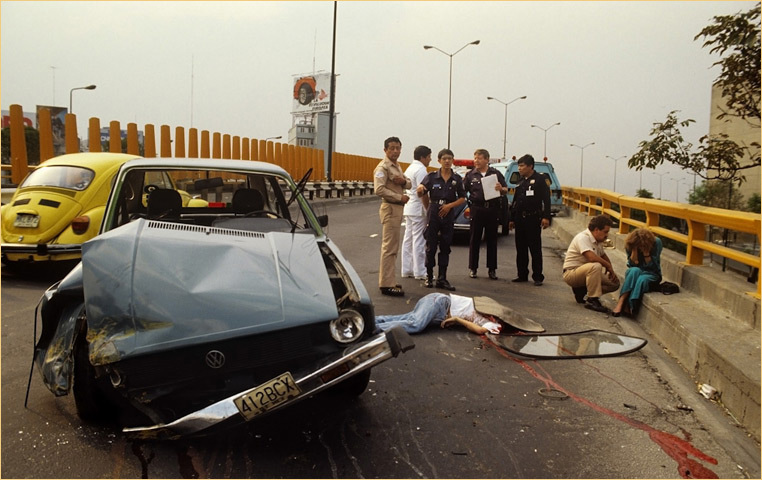 A man was killed when he crashed his car on the Circuito bridge on the way to Toreo, on the corner of Mariano Escobedo. 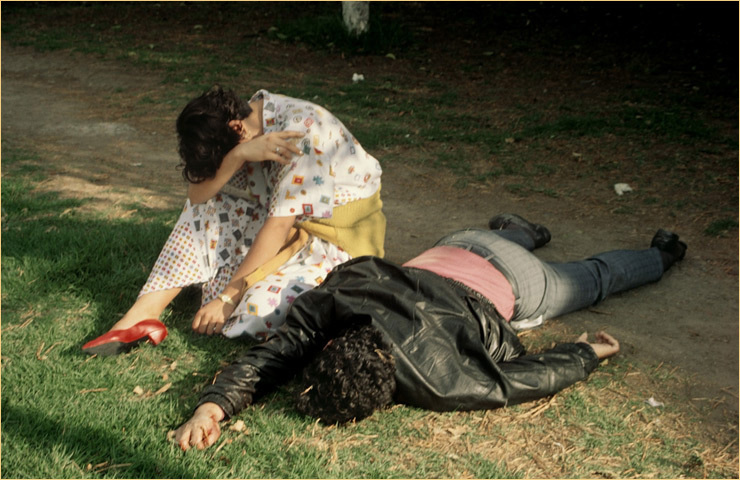 His sister, unhurt after the accident, weeps next to the body, 1973. The journalist and writer dies crossing Avenida Chapultepec, on the corner of Monterrey in Colonia Roma, Mexico City. When the two cars crashed, she was crushed against a lamp-post. She had just come out of a beauty salon and was due to present her latest book to the press that afternoon. Since the telephone in the beauty salon did not work, she went to tell her sister that a car would come to pick them up to go to the event. They lived two blocks away from the tragic accident. She died because one of the cars ran a red light. 29 April, 1979. 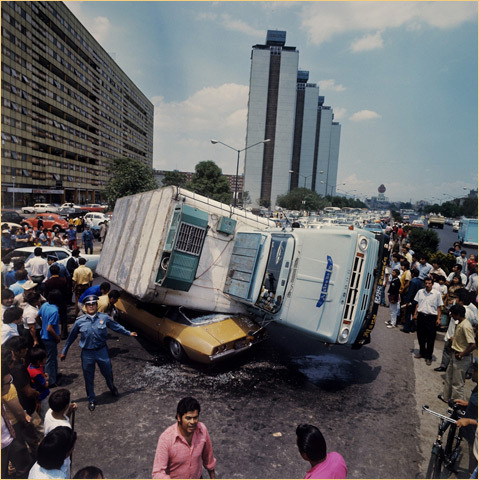 A truck overturned, crushing a car on Paseo de la Reforma opposite the Tlatelolco unit that collapsed a few years later during the 19 September 1985 earthquake. 5 April 1973. 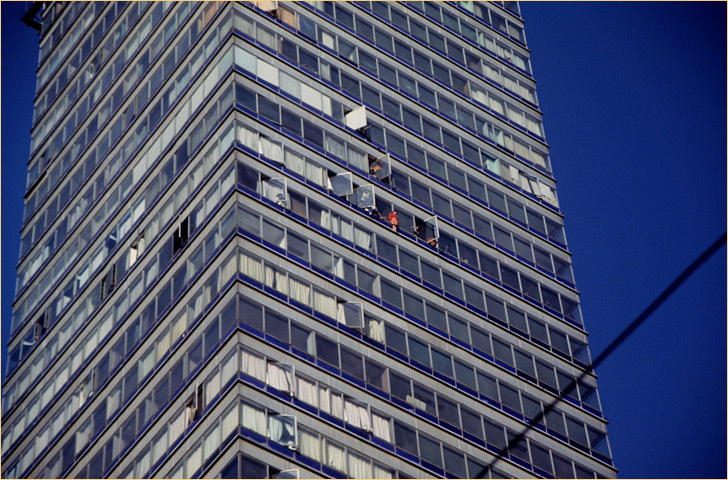 Guadalupe N. Guzmán, who was depressed and desperate for money to maintain her three children, climbed up to the 27th Floor of the Latin American tower to commit suicide but was saved by the Red Cross. December 1993. 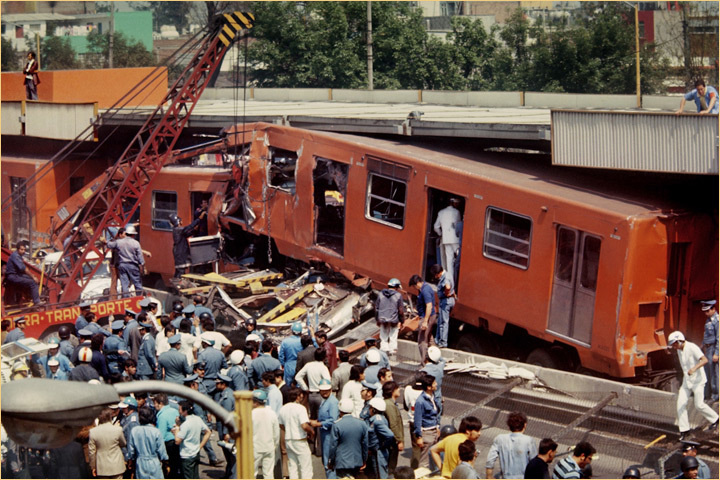 Crash between one subway car and another that was letting passengers on and off at Viaducto station on Calzada de Tlalpan, on the way to Taxqueña: 27 dead, 86 serious injured and 500 slightly injured. 21 October 1975. 11|17 Mustang sinking into the water, 1989. 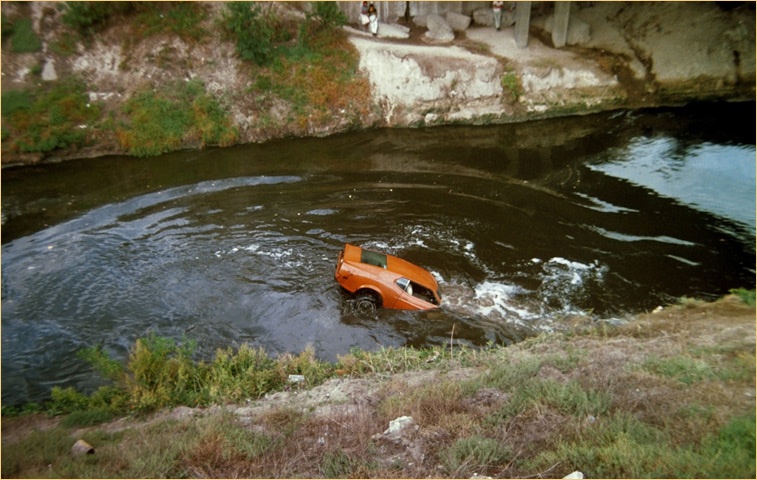 EA Ford Mustang fell into the San Cristóbal Canal in Ecatepec, Mexico State on the Mexico-Pachuca highway. The three persons in the car died when they left the car. They were carried away by the current. 1989. A month after their wedding, a couple went to Chapultepec Lake for a boat trip. They were attacked in the woods by two criminals armed with knives. He tried to resist and was killed in front of his wife who cries next to his corpse. It was Sunday midday, 1985. Burning gas station San Antonio Abad, Colonia Obrera, Mexico City. Three young men were putting gas into their car. 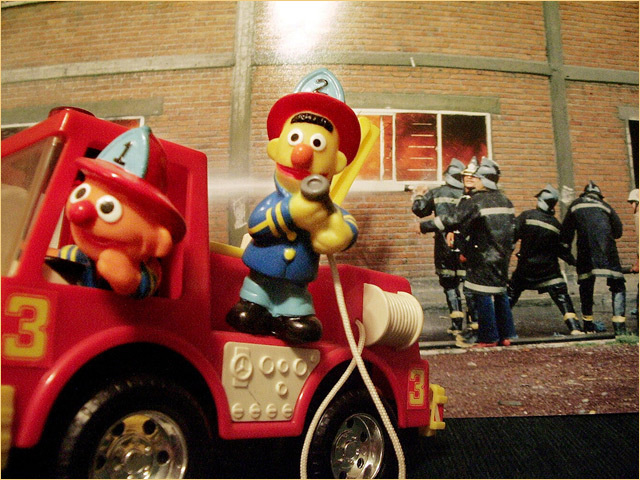 Before they finished, they drove away to avoid paying, pulling out the hose that was still working. 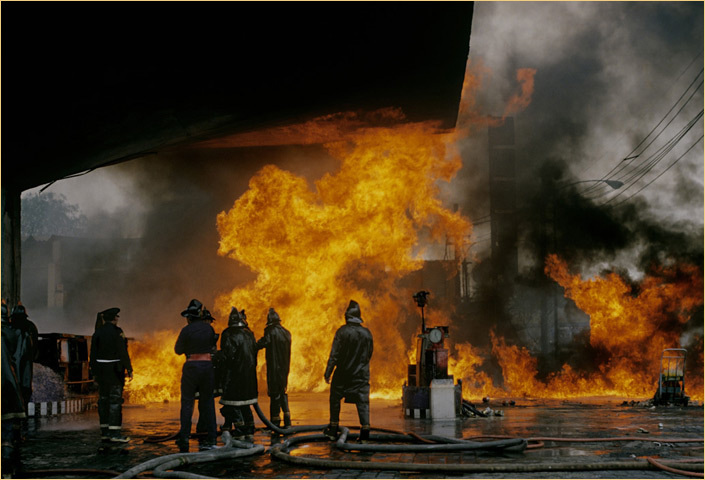 The gasoline spilled everywhere and exploded, burning 15 cars and the entire gas station, 1983. 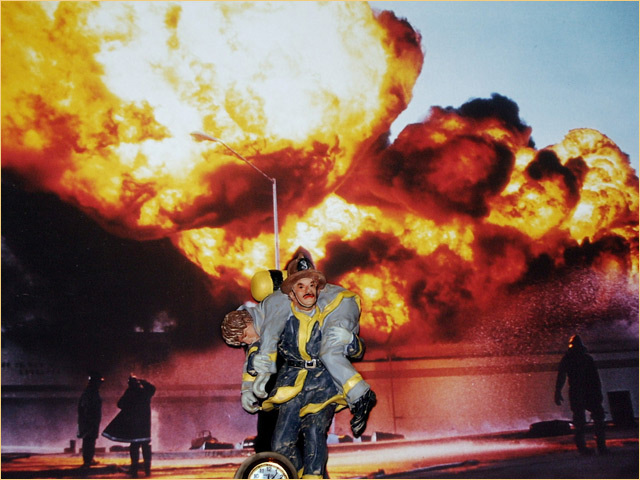 EExplosion and fire in a refinery in Tula with 14 cm figure and fireman carrying a wounded colleague, August 2009. 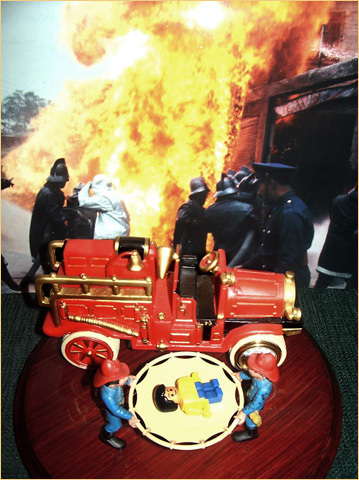 Tragic fire in a building in Glorieta de Cibeles, Plaza Madrid in Colonia Roma, which claimed the lives of 19 persons, with a collector's truck and 2 ½ cm policemen and firemen figures. February 2010. 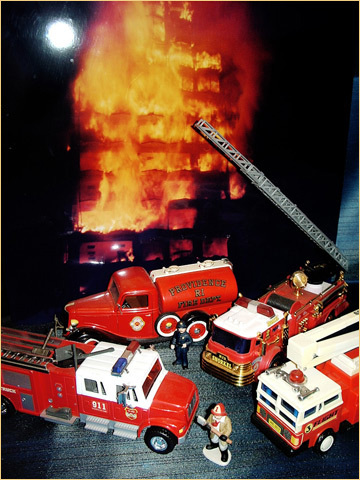 Fire in a factory in Ticomán, Federal District, and collector’s firetruck. With Beto and Enrique, March 2009. Increíble serie, Me parece fascinante la manera como logra mostrar la estética de lo bizarro. Estimado maestro de la lente , y el momento.Primero, reciba ud. un modesto reconocimiento a ud. pero sobre todo a esa extensa obra que ha de tener, y de que en México no lo reconocen, con tristeza le digo, que es muy lamentáble ese fenómeno, así somos de ignorántes, ingratos, incultos y demás. La mejor técnica para llamar la atención es causar expectativa y sorpresa, crear un concepto imaginario en la mente del espectador es mucho mas atractivo y creativo que tener a la vista el retrato del hecho en cuestión, además de tener una gran persona como lo es Enrique Metinides que en lo personal su trabajo me parece creativo y con clase, ya que desde mi punto de vista en la fotografía lo mas importante no es captar la imagen sino captar el momento y pienso que solo se logra con sentimiento. La manera en la que piensa sus fotografías que no solo son periodísticas sino que también son artísticas como él mismo lo menciona me parece distinguible, maravilloso, sorprendente!!!!. Muchas felicidades y que orgullo contar con gente como Metinides en nuestro país.